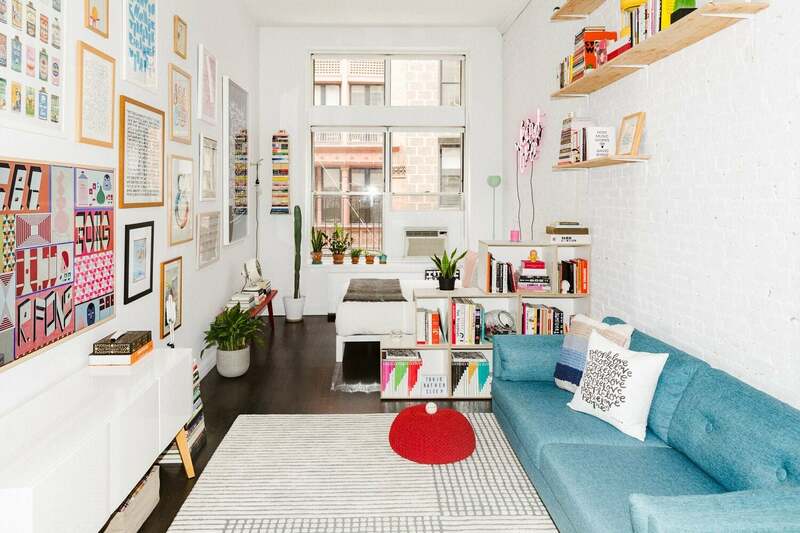 There’s small-space living, and then there’s living in a studio apartment. Things get exponentially trickier to maneuver the second you eliminate apparent luxuries such as “walls.” But before you restrict your furniture to only a mattress on the floor out of design desperation, read this. Between smart space configuration ideas, designer tips, and market finds that’ll be total lifesavers in your studio, we have you covered. Here’s how to hack your apartment, once and for all. 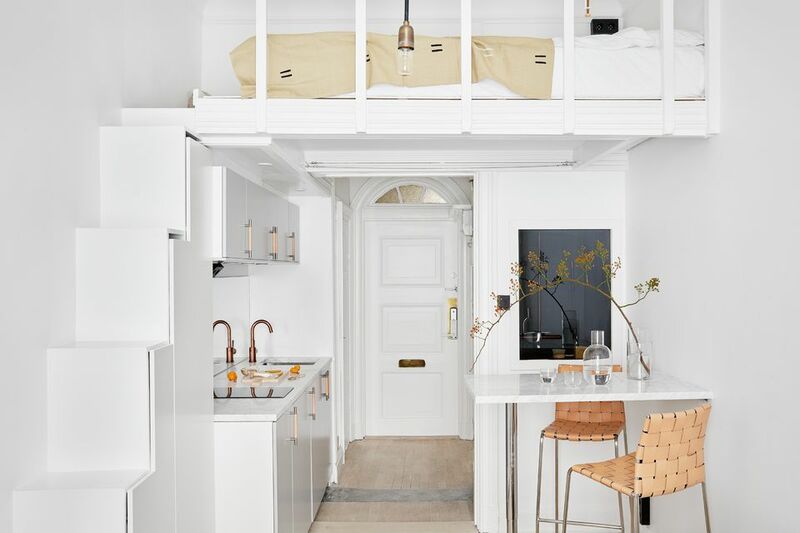 To kick things off, let’s take a look at some of the coolest studio apartments we’ve seen for a little bit of style inspo. 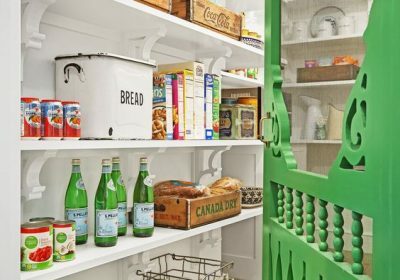 These spaces defy their size and are packed with unique style, featuring smart storage ideas and innovative layouts you’ll want to copy asap. No space for a separate bedroom? Make your own. This space utilizes curtains and a mini staircase leading up to the bed to create the illusion of a slightly removed space. Incorporating curtains also add privacy to a studio—helpful if your home, like this one, has a living space mere feet away from where you sleep. Graphic designer Timothy Goodman is known for his bold, colorful style, and he certainly doesn’t sacrifice that in his home due to a lack of square footage. 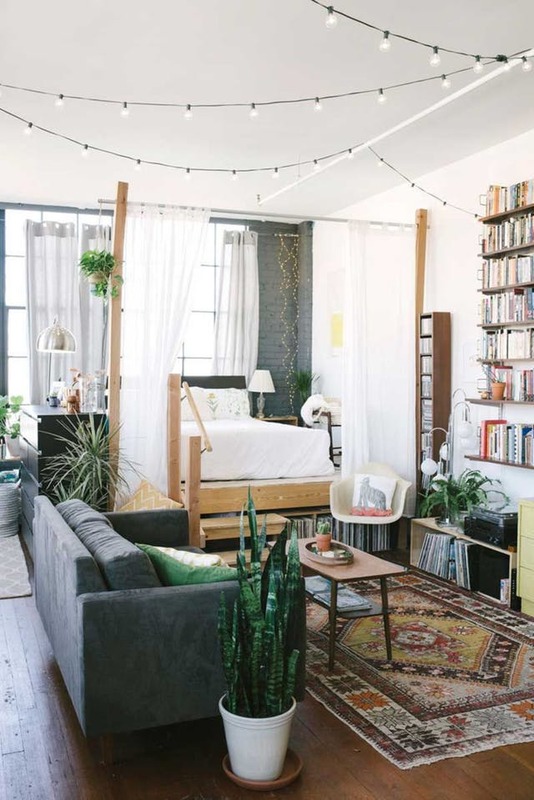 You may have to walk through the living room to get to the bedroom, but that journey is peppered with a rainbow-hued decor and punchy artwork that breathe life into the 700-square-foot abode. Rather than make the studio feel cramped, his eclectic style brings vibrancy to what could otherwise be a restrictive-feeling space. On the flip side, if you’re nervous about overusing color (or aren’t a graphic designer with previous experience in infusing bold style into space), a foolproof tactic is relying on neutrals. 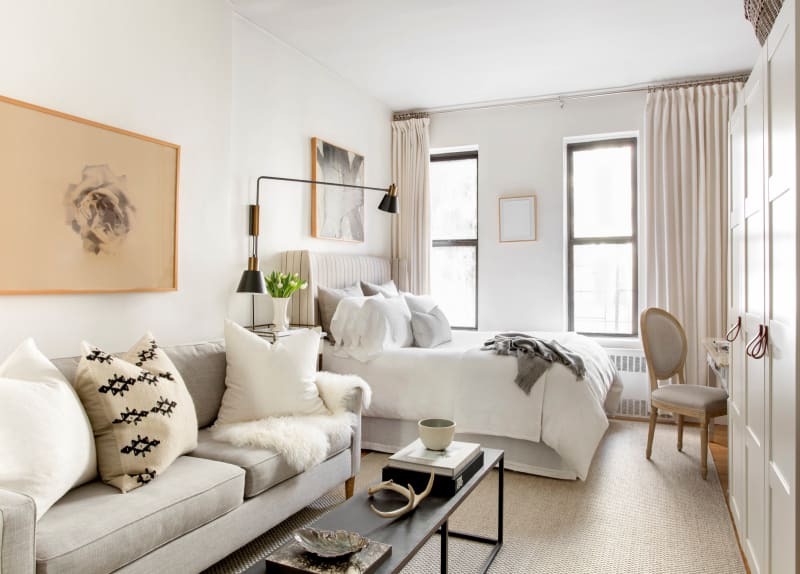 Designed by Meagan Camp, this 300-square-foot studio feels instantly calm and collected thanks to subdued, warm neutrals in timeless, sophisticated styles. 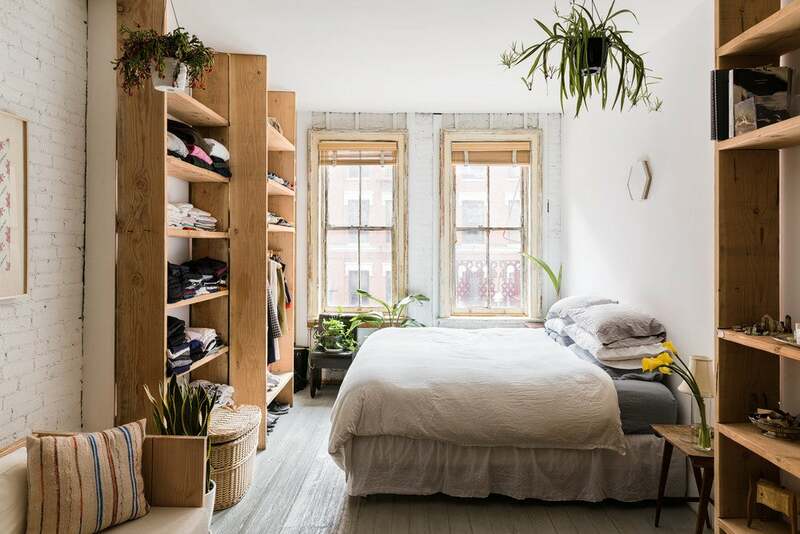 If your studio happens to be as blessed with tall ceilings and natural light as this Brooklyn apartment, consider yourself lucky and maximize the benefits. Opt for low-profile furniture to add even more height to the space and make for an airier feel—a trick one of our writers swears helped save his Chinatown apartment. Need to brighten a tiny space? You’ve already given your walls a fresh coat of paint—preferably a clean white, designers’ go-to hue for enlarging a tiny home—so time to turn your attention to the floors. Whitewashing darker hardwood instantly makes any space ten times brighter and provides a flexible backdrop, which in turn gives you more leeway to go bold with your decor. 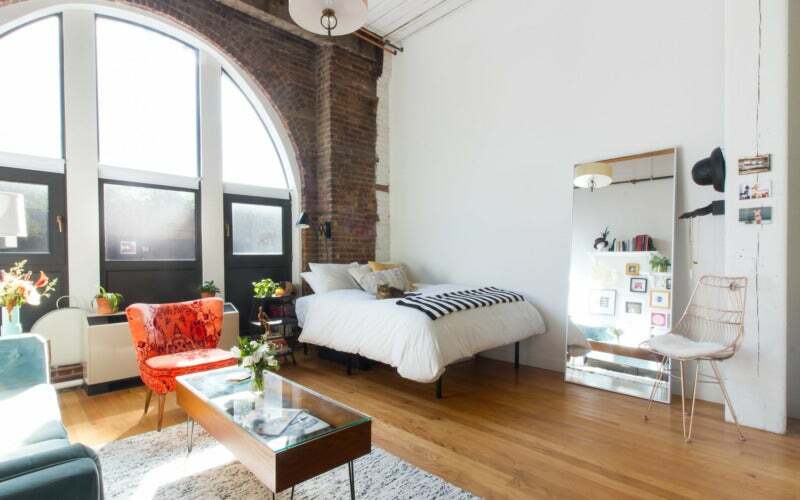 If possible when apartment hunting for your dream studio, try to find a space that’s lofted. Not only does this lend some very tangible physical boundaries to your space (you won’t have to fake a separate bedroom with a strategically placed bookshelf! ), but it means that the ceilings in your apartment will likely be taller by dint of it being a loft. Which then means that the space itself is going to feel a lot bigger. Our main takeaway from this NYC studio—tour the whole space here—is the importance of flow in an apartment: It starts with the bedroom on one end, moving into a living space, transitioning into the kitchen, and ending with a tiny bathroom on the other end. There may not be doors or even archways separating each space, but by keeping everything clearly defined nothing feels superfluous or messy. We went straight to the experts to learn what they would do for a challenging small space—and they delivered. Read on for designer’s tips on all things studio apartment design. Bigger Is Better, Less Is More. “One piece of oversized art (versus a gallery) can make the whole room seem bigger, and take attention away from the size restraints of a studio,” says Raili Clasen. Edyta Czajkowska similarly recommends keeping proportion top of mind: “Using a few larger pieces of furniture instead of small pieces will make your space feel more substantial,” she says. Look for Multifunctionality Wherever Possible. For example, Clasen opts for floor pillows over chairs as living area seating options, because they can slide right under a table when they’re not being used and double as bohemian accent pieces. Another genius trick? Using your table as art, which works particularly well in unusual “studio” homes like boats or RVs. “Attach a fold-down hinged table to the wall, and attach a piece of art on the backside so when the table is up, the artwork hides that backside of the table,” she says. 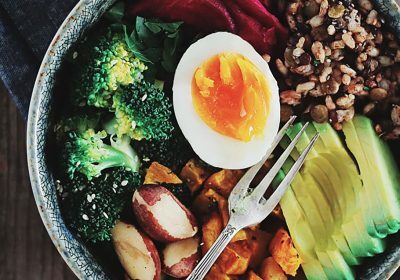 Now that you have your design inspo and are armed with expert tips, it’s time to put your plans into action. Here, some of the best multipurpose pieces on the market right now your studio needs. 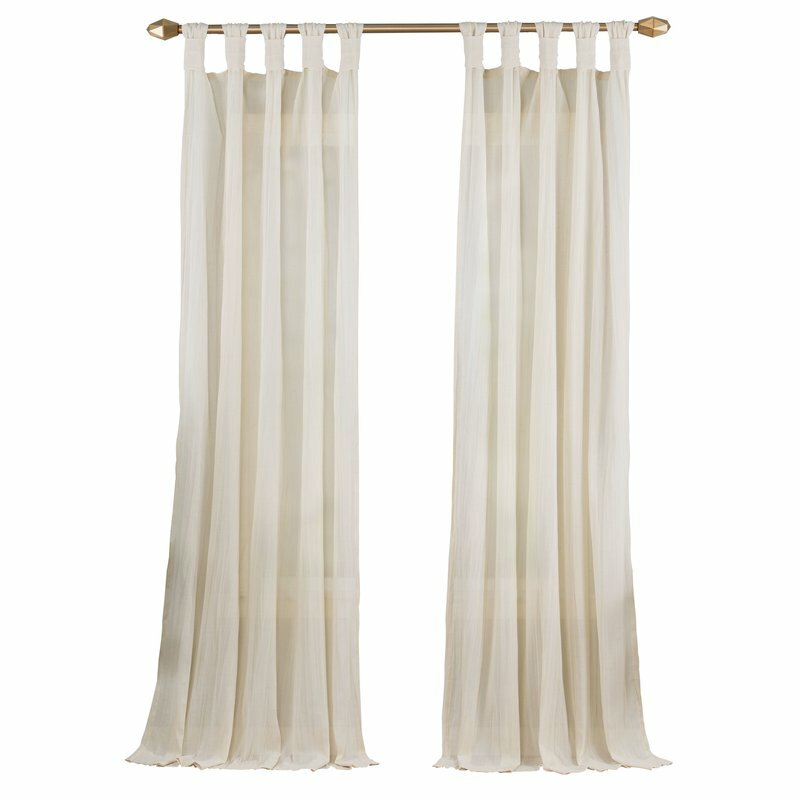 How to: Use them to section off a room in need of more privacy in lieu of real walls. Linen is more elevated than a regular gauzy material, making even the most functional of layout changes feel like a design moment. 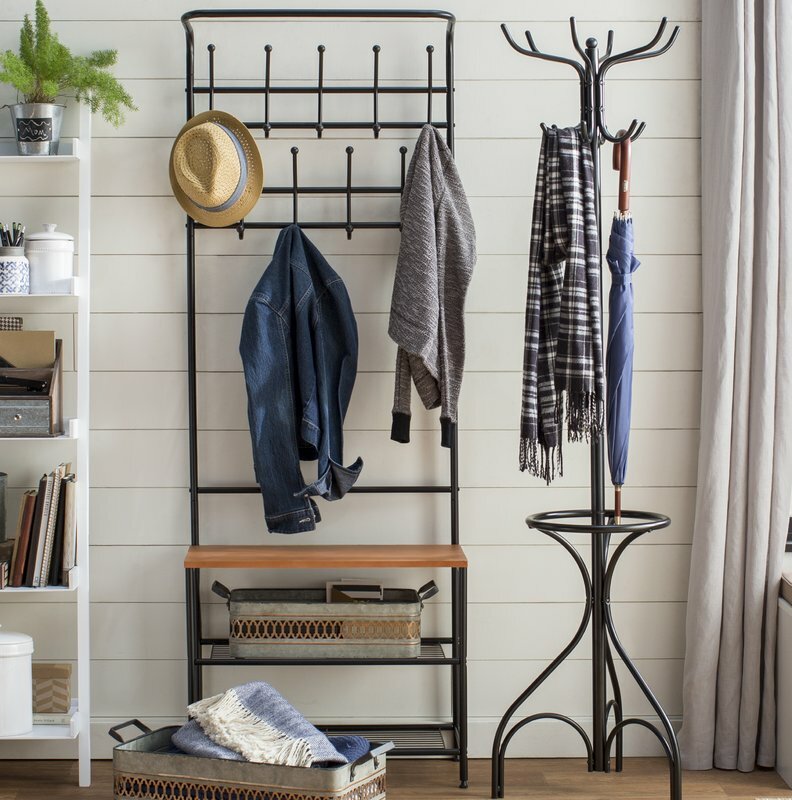 Bring order to your closet, laundry room, home office and more with custom storage solutions. Short on wardrobe space and no room for a formal dresser? This bed is the answer to your prayers. 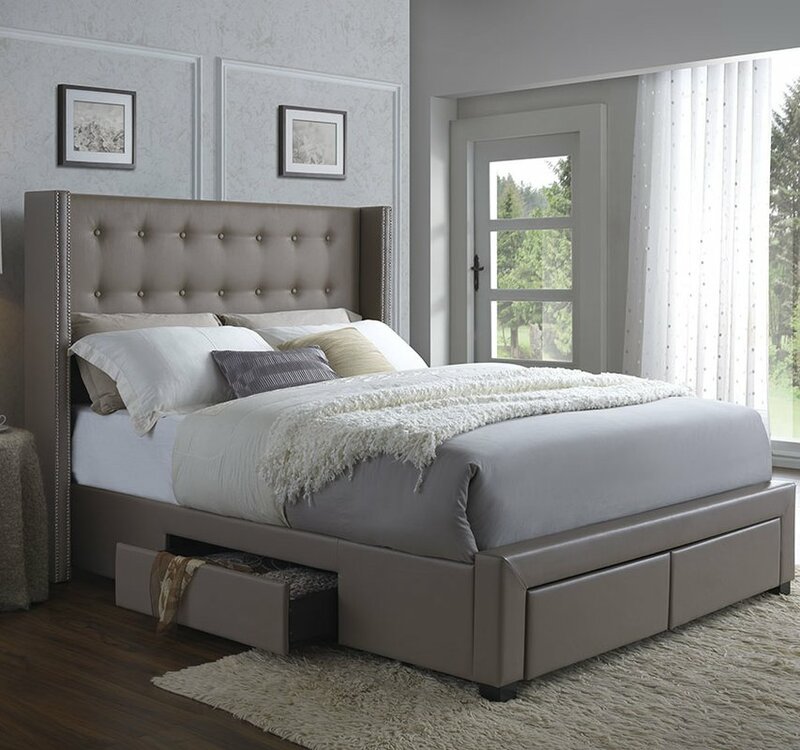 Embedded drawers are the quintessential stylish storage solution, and this simple yet sophisticated bedframe design means you’ll want to keep it around long after you’ve left your studio for something with a real bedroom. Ideal for frequent entertainers, this useful contraption provides extra surface space (plus shelves, if you’re short on cabinet storage and need somewhere to keep groceries) but can also be easily folded and put away to avoid cluttering the kitchen. 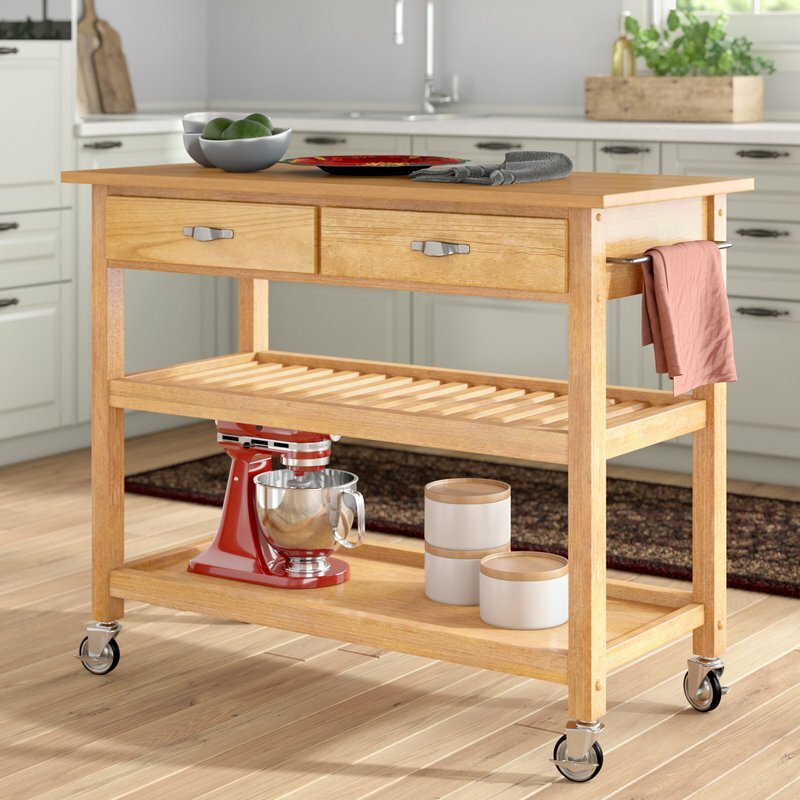 It’s basically a makeshift kitchen island on-the-go. You love the look of a coffee table—and you need somewhere to hold your coffee table books—but you don’t exactly have tons of living room real estate to give away on a whim. 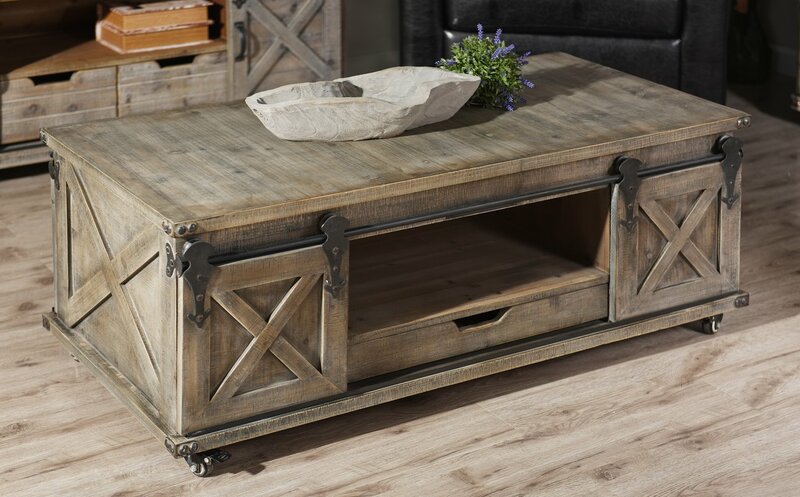 For when your coffee table needs to do more than just be a finishing touch, opt for one with built-in storage. Keep anything from bulky winter knits to ugly electronics hidden in this sleek piece.